Discover the best places to go, what to do and where to dine whilst in Hawkshead. Hawkshead is a traditional Lakeland village with picturesque cottages, narrow streets and an abundance of independent, speciality shops. WALK: There are plenty of walks to choose from in Hawkshead, however, our top pick is Latterbarrow Hill – a delightful 5 mile walk. During the ascent you’ll be greeted by stunning views over Esthwaite Water and once you’ve reached the summit a panoramic view of the surrounding Lakeland fells is truly spectacular! CAFE: Poppi Red is a fantastic place to stop for a cake and coffee after exploring the village or perhaps a fell walk. The tea room is beautifully decorated and on a nice day why not sit outside and enjoy the sun? Poppi Red also features a beautiful shop with unique jewellery and homeware pieces you can take away with you. If you’re on the go and still busy exploring Hawkshead why not treat yourself to an ice cream? 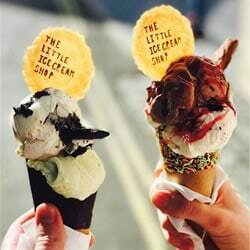 The Little Ice Cream Shop has over 20 unique flavours including rhubarb & custard, bonfire night toffee and banoffee pie – yum! MUST SEE: Hilltop is located in Near Sawrey, around 10 minutes drive from the village of Hawkshead. This 17th Century Farmhouse once belonged to famous children’s author Beatrix Potter and today it resembles a time capsule of her life. BAR/ PUB: The Queen’s Head is located in the heart of Hawkshead Village. This 17th Century Inn serves up delicious, locally sourced food throughout the day. Perfect after a long day walking on the surrounding Lakeland fells! SHOP: Hawkshead Relish is an artisan producer of scrumptious preserves based in Hawkshead Village. Don’t forget to stop by the store to pick up some delicious relishes, ketchups, jams and more before returning home.